Behavioral Interventions--For Kids! 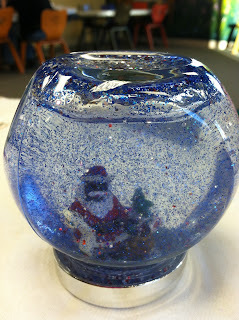 : Snow globes! 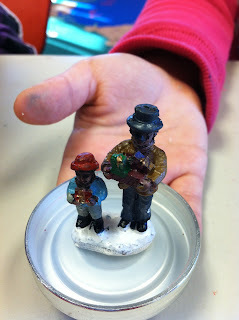 May be a little late for Christmas, but this activity can really work all winter. Begin by gluing your figure (this one found at a dollar store) to the lid, allowing plenty of time to dry. Just like the mind jars, add water with glitter and glitter glue, or you could also add food coloring. 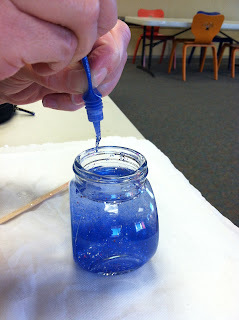 When your figure is nice and dry on the lid, put the lid on the jar (can seal with glue) and shake it up to mix the glitter glue and glitter. The concept you are working on, beside having a fun winter activity, can be the same as a mind jar-talking with your client about anxiety, swirling thoughts, taking a break for as long as it takes the glitter to settle, or as an overall soothing activity.